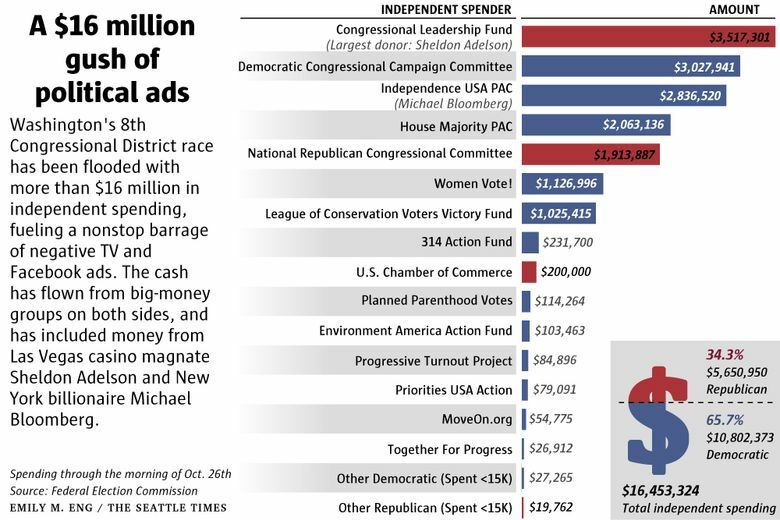 As of Friday, outside groups had poured more than $16 million into the race, in addition to the $9 million spent by the Rossi and Schrier campaigns. With just over a week remaining before the Nov. 6 general election, those figures are sure to grow. 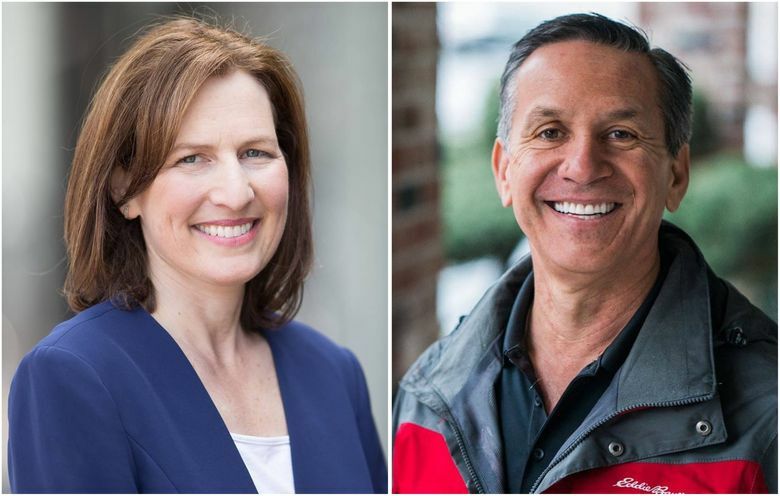 Fueled by an unprecedented infusion of cash from out-of-state political groups, Washington’s 8th Congressional District race between Dino Rossi and Kim Schrier has surpassed $25 million in spending — making it one of the costliest House races in the country. The cash has flowed from national Democratic and Republican political committees, as well as environmental and business groups, advocates for women’s health and science, the National Rifle Association, even the national Humane Society. While numbers continue to shift, as of Saturday, the 8th District ranked as the costliest House race in the nation in terms of combined spending by general-election candidates plus outside groups, according to the Center for Responsive Politics. In terms of political advertising, it ranked number two as of last week, with more than $20 million spent on ads, behind only Pennsylvania’s 1st District, according to ad-tracking firm Advertising Analytics. That money has purchased a stream of negative TV ads in the Seattle media market, filling commercial breaks with back-to-back-to-back spots portraying Schrier as a tax-raising liberal menace and Rossi as a callous career politician slashing children’s health care. 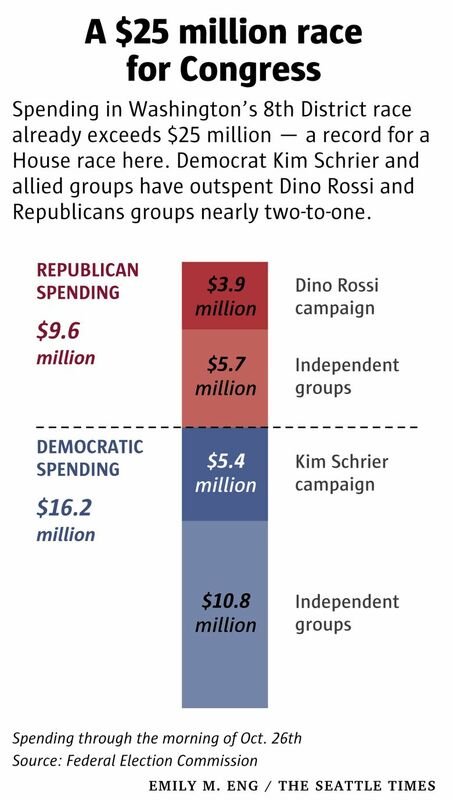 The surge in spending comes as both parties see the Rossi-Schrier race as tight, one of two dozen or so that will decide control of the House in a midterm election viewed as a referendum on the leadership of President Donald Trump and the GOP-controlled Congress. The race is already the most expensive House contest in state history. The previous record for candidate fundraising was in 2012, when Rep. Dave Reichert, R-Auburn, and his Democratic opponent combined to raise more than $7 million. Reichert’s retirement announcement last year set up the open-seat race between Schrier and Rossi. Nationally, with partisan tensions spiking donor interest, the Center for Responsive Politics projects spending in the 2018 election will exceed $5 billion, making it the costliest congressional election in U.S. history. “The big ongoing story line is that every cycle the numbers go up and up. This midterm has already seen more outside spending than the entire 2014 cycle,” said Andrew Mayersohn, a researcher with the center. 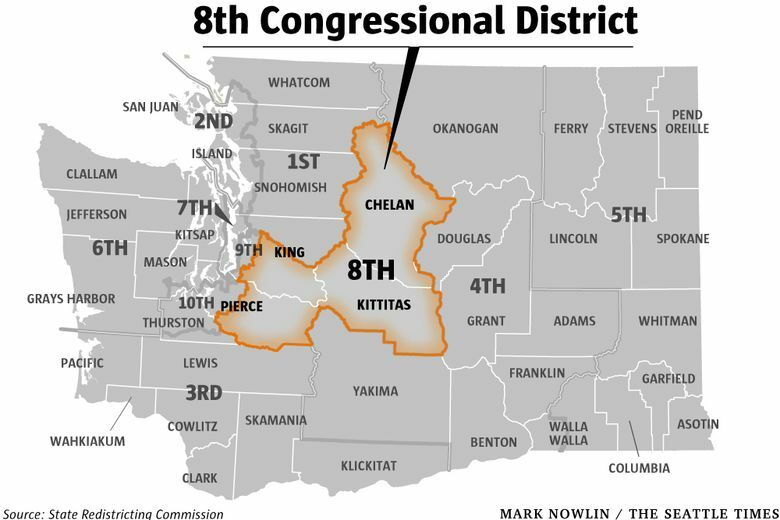 Mirroring the national picture, Democrats have outspent Republicans nearly 2-to-1 in the 8th District race, with Schrier and Democratic-allied groups spending more than $16 million, compared to about $9.5 million for Rossi and Republican allied groups, according to Federal Election Commission filings as of Friday morning. Democratic fundraising also has surged in Washington’s two other competitive House races. In southwest Washington’s 3rd District, Democrat Carolyn Long has reported raising about $3.3 million, compared with $2.3 million for incumbent Rep. Jaime Herrera Beutler, R-Vancouver. And in Eastern Washington’s 5th District, Democratic challenger Lisa Brown has raised $5.3 million, nearly matching the $5.5 million brought in by Rep. Cathy McMorris Rodgers, the fourth-ranking House Republican. Behind the independent-spending explosion nationally lies a growing influence of wealthy megadonors who have been unleashed, in part, by court rulings striking down limits on political spending. The rising sway of the superrich has alarmed some watchdog groups that favor reducing the influence of big money in politics. “Independent spending is the campaign-finance arms race … which has the potential to give the few wealthy interests who can provide that money outsize influence in government,” said Ian Vandewalker, senior counsel for the Democracy Program of the Brennan Center for Justice at New York University School of Law. Billionaires are also behind some of the spending on both sides the 8th District race. For Democrats, billionaire and former New York City Mayor Michael Bloomberg’s Independence USA PAC has spent more than $2.8 million on ads opposing Rossi. Bloomberg also is a top donor to the League of Conservation Voters Victory Fund, a super PAC that dropped $1 million in ads against Rossi last week. Bloomberg, who is considering a 2020 presidential run, has committed $100 million to try to flip control of Congress from the Republicans. Meanwhile, the biggest-spending Republican group, the Congressional Leadership Fund (CLF), which has committed more than $3.5 million to ads attacking Schrier, counts as its top donors billionaire Las Vegas casino magnate Sheldon Adelson and his wife Miriam. CLF is affiliated with House Speaker Paul Ryan, R-Wisconsin. The Adelsons have committed at least $87 million to support Trump and maintain GOP control of Congress, The Washington Post reported this month. Some of the biggest spenders accept so-called “dark money” donations through nonprofit groups that do not disclose their contributors, making it impossible to obtain a complete picture of who is influencing the election. For example, the CLF has received more than $20 million in donations from the American Action Network, a conservative dark-money group, according to OpenSecrets.org. While the bulk of the political spending in the 8th District has gone to TV ads, some conservative and progressive groups also have paid for canvassers to go door to door to persuade voters. The group’s political director pointed to Rossi’s sponsorship in the Legislature of bills to authorize hunting of cougars with the aid of dogs, and to allow the use of body-gripping animal traps. Both Rossi, the former Republican state senator and three-time candidate for statewide office, and Schrier, a first-time Democratic candidate, have complained about the negative ad bombardment and spending by the other side. “My opponent’s number one supporter is Nancy Pelosi, who’s probably spent more money against me than any other human being in America,” said Rossi during the only debate in the race, held this month in Ellensburg. He was referring to the Democratic Congressional Campaign Committee (DCCC), and House Majority PAC, both affiliated with Pelosi, the House minority leader from San Francisco, who raised money for the DCCC during a a private fundraiser in the Seattle area last month. Those two groups combined have spent more than $5 million in the 8th District. Schrier responded at the debate that “We’re all frustrated by the negative ads and the attacks, “saying “the root of it all” is an explosion of big-money politics since the 2010 Citizens United decision by the U.S. Supreme Court, which led to unlimited independent spending on political ads by corporations and unions. “There’s only one person up here who really wants campaign-finance reform, and that’s me,” said Schrier, who has refused corporate PAC donations and supports a constitutional amendment to overturn the Citizens United decision. While they may be a boon for TV stations and the political-ad industry the ultimate effectiveness of the political-ad wars remains to be seen. As of Friday afternoon, nearly 14 percent of ballots mailed statewide had already been returned, according to Secretary of State Kim Wyman’s office. John Murray, a former Republican congressional staffer and political consultant, questioned whether the groups spending so much, so late, in the homestretch of the election are getting much for their money. Sandeep Kaushik, a Democratic consultant, agreed the late spending may not be highly cost effective. Clarification: The national Humane Society’s political group, which has endorsed Kim Schrier, is not affiliated with local humane societies and shelters. A previous version of this story did not make the distinction clear.